RadioGet Full - RadioGet plays online radio stations, filters and records music to mp3 tracks. RadioGet plays online radio stations and records their music to mp3 tracks. With over 25,000 free web radio stations out there, and the ability to add even more, you can listen to music of almost any genre and flavor while recording it to your hard drive. In fact, RadioGet can even silently record several radio stations simultaneously. Leave it recording a couple of stations (as many as you want) and you`ll rack up a huge collection of free legal mp3 tracks in no time. RadioGet Full edition can also filter songs to record only those performed by artists you specify. What's New: RadioGet plays online radio stations and records their music to mp3 tracks. With over 25,000 free web radio stations out there, and the ability to add even more, you can listen to music of almost any genre and flavor while recording it. This download (RadioGet_3.3.8-Setup.exe) was tested thoroughly and was found 100% clean. Click "Report Spyware" link on the top if you found this software contains any form of malware, including but not limited to: spyware, viruses, trojans and backdoors. 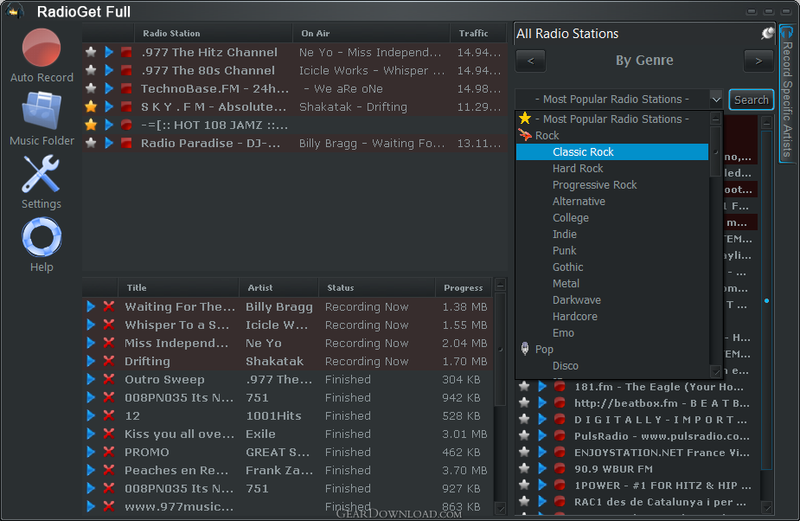 RadioGet Full 3.3.8 - RadioGet plays online radio stations, filters and records music to mp3 tracks. GetRadio Full 3.3.3 - GetRadio plays online radio stations, filters and records music to mp3 tracks. QuickVoice for OSX 2.2.0 - A feature-rich voice recorder with voice email. Mixcraft 6.0_b191 - Mixcraft 6 is a powerful music production and multi-track recording workstation.